Dr. Michael Eric Dyson is a Georgetown University sociology professor, a New York Times contributing opinion writer, and a contributing editor of The New Republic, and of ESPN's The Undefeated website. Tears We Cannot Stop has been named as one of "The 7 Best Books of January" by the Mens' Journal and is on the Washington Post's list of "What books to read in 2017: 26 titles to start the year." An instant New York Times Bestseller, Tears We Cannot Stop, is available at all major retailers, including Amazon, Barnes & Noble, and Apple iBooks. Here’s a sermon that’s as fierce as it is lucid. It shook me up, but in a good way. This is how it works if you’re black in America, this is what happens, and this is how it feels. If you’re black, you’ll feel a spark of recognition in every paragraph. If you’re white, Dyson tells you what you need to know―what this white man needed to know, at least. This is a major achievement. I read it and said amen. Michael Eric Dyson is alive to the fierce urgency of now and yet he's full of felicitous contradictions: an intellectual who won't talk down to anyone; a man of God who eschews piousness; a truth-teller who is not afraid of doubt or nuance; a fighter whose arguments, though always to the point, are never ad hominem. 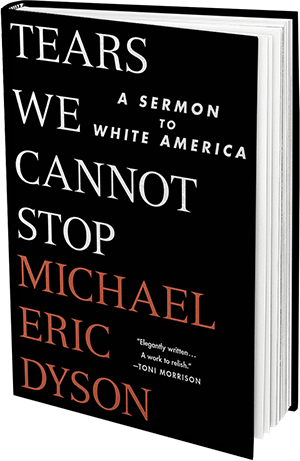 We can and should be thankful we have a writer like Michael Eric Dyson is our midst. Elegantly written, Tears We Cannot Stop is powerful in several areas: moving personal recollections; profound cultural analysis; and guidance for moral redemption. A work to relish. A hard-hitting sermon on the racial divide... The readership Dyson addresses may not fully be convinced, but it can hardly remain unmoved.